We are a leading Manufacturer of hole saw sets from Delhi, India. 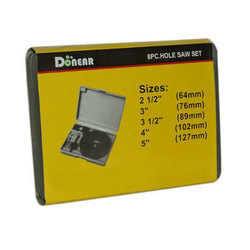 Driven by an intense desire to acquire utmost approval, we render the best grade of the finest quality of Hole Saw Sets. Known for their high functionality, thermal stability and easy operation, the saw sets are manufactured by using modern machinery. For the purpose of cutting different materials in the most efficient manner, the use of saw sets is recommended.